^ a b c d Einstein, A. (1925). 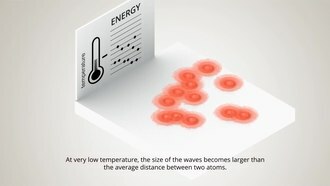 “Quantentheorie des einatomigen idealen Gases. Zweite Abhandlung”. Sitzungsber. Preuss. Akad. Wiss., Phys. Math. Kl. 1: 3. https://web.physik.rwth-aachen.de/~meden/boseeinstein/einstein1925.pdf. ^ a b c Anderson, M. H.; Ensher, J. R.; Matthews, M. R.; Wieman, C. E.; Cornel, E. A. (1995). “Observation of Bose-Einstein Condensation in a Dilute Atomic Vapor”. Science 269: 198. doi:10.1126/science.269.5221.198. ^ a b c Davis, K. B.; Mewes, M.-O. ; Andrews, M. R.; Druten, N. J. van; Durfee, D. S.; Kurn, D. M.; Ketterle, W. (1999). “Bose-Einstein Condensation in a Gas of Sodium Atoms”. Phys. Rev. Lett. 75: 3969. doi:10.1103/PhysRevLett.75.3969. ^ Bose, S.N. (1924). “Plancks Gesetz und Lichtquantenhypothese”. Zeitschrift fur Physik 26: 178. doi:10.1007/BF01327326. , 英訳版 Bose, S.N. (1976). “Planck’s Law and Light Quantum Hypothesis”. Am. J. Phys. 44: 1056. doi:10.1119/1.10584. http://hermes.ffn.ub.es/luisnavarro/nuevo_maletin/Bose_1924.pdf. ^ Einstein, A. (1925). “Zur Quantentheorie des idealen Gases”. Sitzungsber. Preuss. Akad. Wiss., Phys. Math. Kl. 3: 18. ^ Stwalley, Willian C.; Nosanow, L. H. (1976). “Possible "New" Quantum Systems”. Phys. Rev. Lett. 36: 910. doi:10.1103/PhysRevLett.36.910. ^ Hecht, Charles E. (1959). “The possible superfluid behaviour of hydrogen atom gases and liquids”. Physica 25: 1159. doi:10.1016/0031-8914(59)90035-7. ^ Fried, Dale G.; Killian, Thomas C.; Willmann, Lorenz; Landhuis, David; Moss, Stephen C.; Kleppner, Daniel; Greytak, Thomas J. (1998). “Bose-Einstein Condensation of Atomic Hydrogen”. Phys. Rev. Lett. 61: 3811. doi:10.1103/PhysRevLett.81.3811. ^ V. F. Sears; E. C. Svensson; P. Martel; A. D. B. Woods (1982). “Neutron-Scattering Determination of the Momentum Distribution and the Condensate Fraction in Liquid 4He”. Phys. Rev. Lett. 49: 279. doi:10.1103/PhysRevLett.49.279. Pais, Abraham (2005). Subtle Is the Lord: The Science And the Life of Albert Einstein. Oxford Univ Press. ISBN 978-0192806727. Pitaevskii, Lev; Stringari, Sandro (2016). Bose-Einstein Condensation and Superfluidity. International Series of Monographs on Physics. Oxford Univ Press. ISBN 978-0198758884. 上田正仁 (1998). “レーザー冷却された中性原子気体のBose-Einstien凝縮”. 日本物理学会誌 53: 663. Cornel, E. A.; Ensher, J. R.; Wieman, C. E. (1999). “Experiments in Dilute Atomic Bose-Einstein Condensation”. Proceedings of the International School of Physics "Enrico Fermi" course CXL (Italian Physical Society, volume of Bose-Einstein Condensation in Atomic Gases, edtited by M. Ingsuscio, S. Stringari and C. E. Wieman. ): 15-66. arXiv:cond-mat/9903109. https://arxiv.org/abs/cond-mat/9903109. Franco, Dalfovo; Stefano, Giorgin; Lev P., Pitaevskii; Sandro, Stringari (1999). “Theory of Bose-Einstein condensation in trapped gases”. Rev. Mod. Phys. 71: 463. doi:10.1103/RevModPhys.71.463. Leggett, Anthony J. (2001). “Bose-Einstein condensation in the alkali gases: Some fundamental concepts”. Rev. Mod. Phys. 73: 307. doi:10.1103/RevModPhys.73.307. Wolfgabgl, Kettelrle; Durfee, D.S. ; Stamper-Kurn, D.M. (1999). 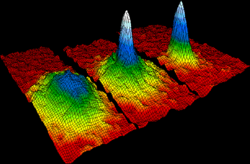 “Making, probing and understanding Bose-Einstein condensates”. Proceedings of the International School of Physics "Enrico Fermi" course CXL (Italian Physical Society, volume of Bose-Einstein Condensation in Atomic Gases, edtited by M. Ingsuscio, S. Stringari and C. E. Wieman. ): 67-176. arXiv:cond-mat/9904034. doi:10.3254/978-1-61499-225-7-67. https://arxiv.org/abs/cond-mat/9904034.